We’ve traveled to a variety of places over the years, but no place has truly taken my breath away like the Amalfi Coast. The dreamy, expansive views around every turn, the charm of each town’s unique little corners, and the genuine warmth of the locals we met easily made this our favorite trip to date. I often found myself pausing just to take in the moment and the scene, wondering if it were real! I got a lot of questions from you guys throughout this trip, and will be answering them in a series of travel guides, starting here with our itinerary and transit tips. Feel free to pin or bookmark this page, as I’ll be linking my later hotel and activity reviews back here in one central post! The toughest part of planning was deciding which coastal towns to visit, then sifting through the myriad of hotel options! We ended up splitting our stay across 3 locations & hotels that were fairly different. The perfect starting point for our trip. We easily could’ve spent more time exploring the outskirts of town! Boat tour excursion with Bluestar Positano. You can choose Capri, Amalfi Coast, or sunset tours. We first visited Capri as part of a boat day trip, then returned to stay in quieter Anacapri. 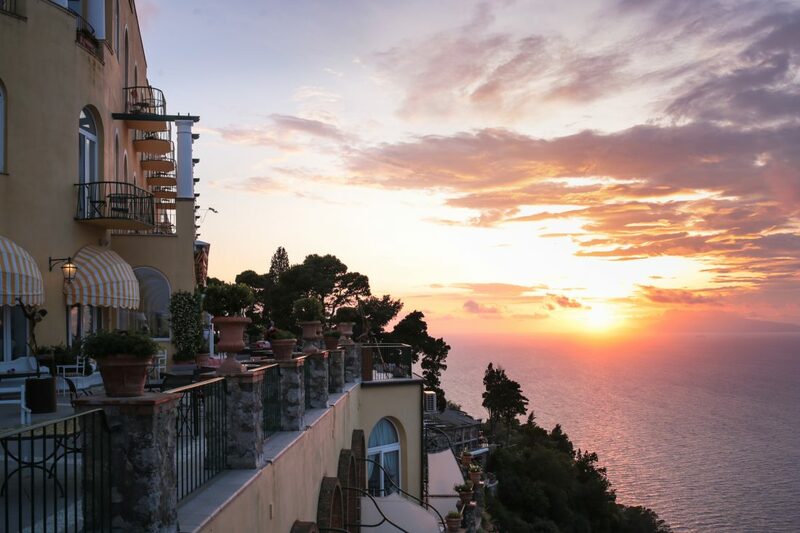 A tiny hilltop town perched between Positano and Amalfi, with an adult-only hotel perfect for R&R. Knowing what I do now after a first visit (second for Nick), here’s our quick take on some of the towns. There are a lot of tours that cover the entire Amalfi Coast in one day, but for a town like Ravello or Positano, a cursory stop just wouldn’t do it justice! If you don’t like changing hotels and just want to pick one place to stay in, I’d definitely choose Positano. The pastel hillside views are iconic and get even better from various spots around town. It’s located centrally between Sorrento and Amalfi / Ravello, so is a very convenient base for day trips via bus or ferry. Yes, it’s touristy and crowded in the main pedestrian part of town, but there are lots of interesting activity and dining options to explore if you just go a little further out (more on this soon). Also be forewarned, there are a lot of steps and inclines so your legs will get quite the workout! Amalfi center felt like the transit hub of the Amalfi Coast, with buses, ferries, and cars coming and going constantly from all the other coastal towns. Apparently, it’s where gelato was born so there is no shortage of that (I might’ve had two cones for breakfast ; ) It was very crowded when I went, so if you want a more peaceful place to stay, the nearby town of Praiano is quieter while still on the main bus route. We actually stayed in an even tinier town off the beaten path, Conca dei Marini (our hotel had a free 15-minute shuttle to Amalfi). The main thing that drew us to Amalfi was the incredible lemon groves, which did not disappoint! Ravello is a super picturesque mountaintop town known for beautifully manicured gardens and hotels with sweeping views. We only got to spend a few hours here, and it wasn’t enough! It had more of a local, less touristy vibe to it, and in hindsight I probably would’ve preferred to stay night or two there instead of in Capri. I didn’t realize how rustic and walkable Ravello was, with many gardens and scenic properties located within a short distance of each other. From the messages I got on Instagram, I know many visitors have differing opinions on Capri. The best way I can describe it is an upscale island town (think streets of high-end designer shops and pricey restaurants, hotels, and clubs) thats’s packed with tourists during the day. Most of these visitors come in via ferry or boat on a day trip, so it quiets down late afternoon once they leave. Anacapri is a quaint town on the other half of the island with stunning cliffside views, but you’ll need to take either a bus or taxi there. We stayed on the island for 2 nights to experience the calm aftermath, but honestly got a little bored toward the end (if you like to hike, though, there’s plenty to keep you busy!) and the vibe of many places felt very “posh.” We did enjoy boating around the island, which I’ll be sharing more about! Peak season runs June through August, and I hear certain towns like Positano can get very crowded. Late May was perfect for us – it was busy with visitors but not too bad, and although it did rain, the weather was a comfy mid-60s / low-70s. I’m not gonna lie, this was our best but also most expensive trip. From hotels to (non-public) transportation to food and drink, we did choose to splurge, but even without splurging I thought most things ran on the pricier side. Try to book lodging as early as possible, as I started looking 2 months prior and most hotels were fully booked. Also, if you visit after peak season in September / October, hotel prices looked significantly lower (many Amalfi Coast hotels then shut down during the winter and re-open in April). 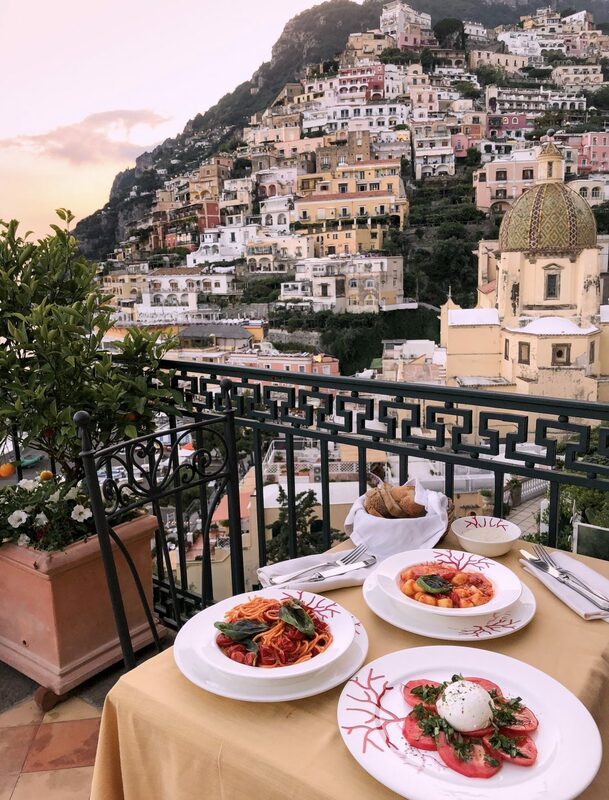 My family was also on the Amalfi Coast as part of a 3-week Italy trip, and they were able to save by renting an Airbnb, taking mostly public transit, and cooking several meals in their apartment. So with some extra travel time and effort, the trip can be done on a budget! To get to the Amalfi Coast, most people fly into Rome or Naples depending on flight options from where you live. We chose Naples because it was the best itinerary at the time (Boston > Frankfurt > Naples via Lufthansa), also it’s closer to the coast so it was a shorter ride to our final destination! 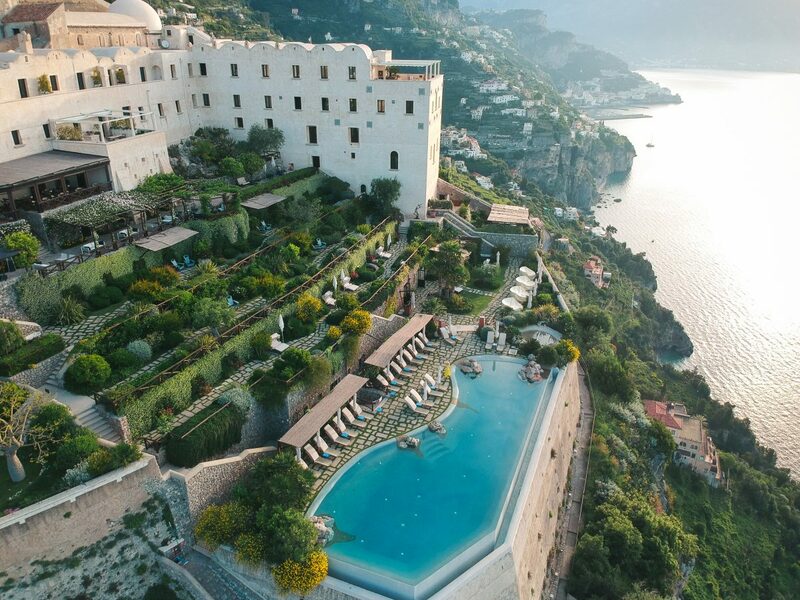 At the urge of friends who had visited before, we hired a driver to take us directly from the Naples airport to Positano (we used Amalfi Car Service several times and would recommend them!). Private car is the most expensive option at ~120 Euros one way, but also the least stressful after a day of flying. The ride from Naples to Positano took about 90 minutes along a winding, picturesque cliff-side road. TIP: the drivers are usually happy to pull over and let you stop once or twice for a photo (wish I did this right when Positano came into view – so gorgeous!). 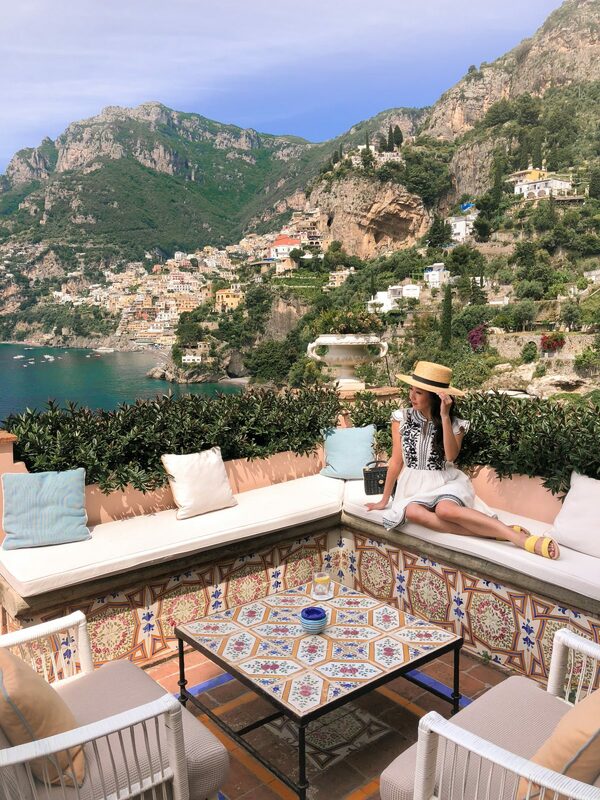 To get from Naples to Positano, you can also take a shuttle to the train station, take a train to Sorrento, and then catch either a bus or ferry to Positano. It’s a more tedious but far cheaper option, for those who are feeling adventurous and don’t have too much luggage. The regular train from Naples to Sorrento takes over an hour and costs under 4 Euros. There’s also an express train along the same route (costs 8 Euros) which my family said was a lot emptier and had several fewer stops. From Sorrento, the public bus to Positano is 2 Euros or the high speed ferry is around 20 Euros. These blue-colored buses are the cheapest way to get around, and tickets can be bought in local tabacherrias (corner stores like 7-11s) or bars. These buses can get crowded, though, especially during peak hours on weekdays since the local kids take them as school buses. The SITA has several stops along two main routes: 1) Sorrento – Positano – Amalfi, and 2) Amalfi – Salerno. So if you’re staying in Positano and want to visit Ravello, you’ll need to change buses in Amalfi. TIP: If you’re staying higher up on the hill in Positano, there might be a public bus stop close by to spare you from having to climb all the way down to the docks for a ferry. These red-colored buses run between popular traveler cities like Amalfi and Ravello. They cost a little more than the public bus, but friends say it’s worth it to get a seat and a slightly shorter ride. Pricier than the buses, but no getting stuck in traffic plus nice views on the water. You can buy tickets easily right at the docks, with each ferry boarding 10 minutes before scheduled departure. 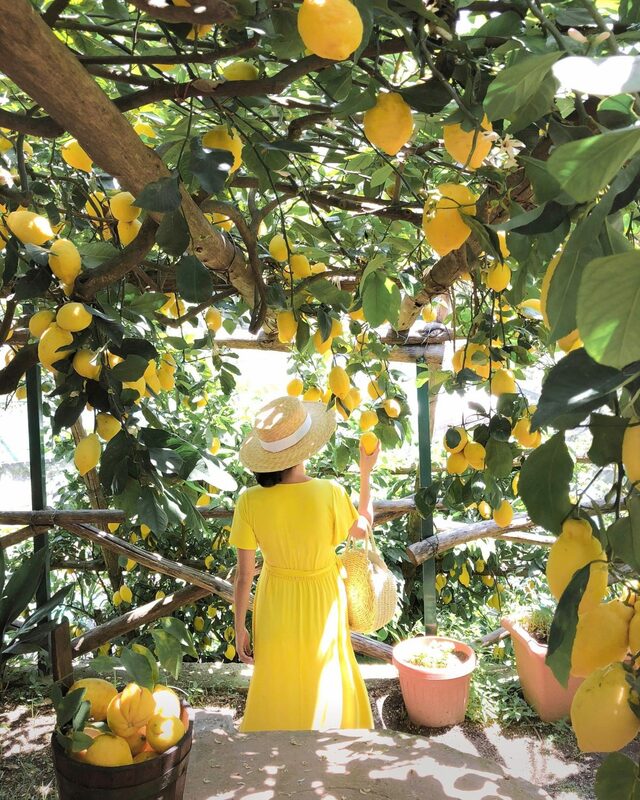 A fun example day trip from Positano would be to take an early ferry to Amalfi, do a lemon grove tour (~10AM), then take a bus to Ravello to explore the charming streets and gardens. Wind down by grabbing a drink or dinner at one of the plentiful hotels there with breathtaking views. Just make sure you don’t miss the last bus / ferry back! 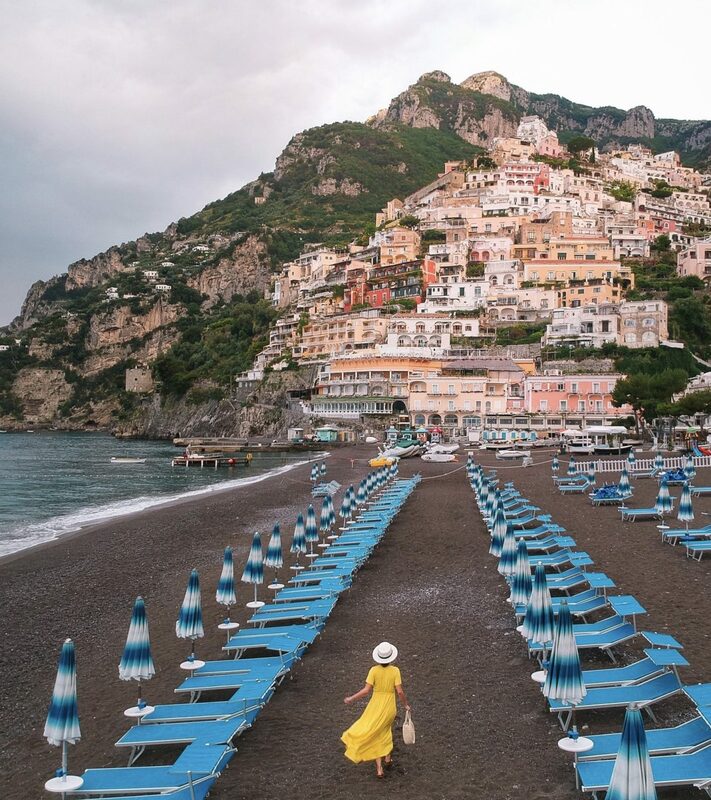 If you’ll be staying in a Positano hotel, a car might only be able to get so close to your hotel/apartment rental due to the stairs and narrow walkways. At some hotels like Le Sirenuse or Hotel Marincanto, the driver can stop right at the door. Our hotel however was at the bottom of the hill in a pedestrian-only zone, so we had to pull into a parking structure where porters are waiting to take your bags to the hotel (6 euros per bag). It’s a little unnerving handing your stuff off to strangers in a parking lot, but this porter system is prevalent throughout the area (with the ferries, too, in Capri … more on that later). That’s it for this first post! We didn’t get to visit Sorrento or Salerno, so for those who have, I’d love to hear your thoughts on those towns (and other notable ones) + what the highlights of your trip were! We’re already dreaming of a return visit! Great post, Jean. How did the ribbed dress in medium fit the bump? I’m debating with medium or small. Thanks! Hi Jen – the ribbed material is very stretchy in all directions so it’s somewhat forgiving in terms of sizing. I would’ve ideally liked a S, but the shipping for that size in black took weeks vs Amazon Prime was available for sz M. The M fits me fine (I’m about 110 lbs now) with some room to grow, although I might shorten the shoulder straps a little to raise the neckline. Hi Alaina, congrats on your upcoming wedding! How exciting : ) I have to say some people really love Capri though so it must just totally depend on what kind of vibe you’re looking for. I know you’ll have an amazing time regardless of which towns you stay in because the entire area is a dream. Happy planning! Thank you Jean for your posting, I am going to these places in July so this info is very helpful. You look pretty as always. Wow, the Amalfi Coast looks stunning! I’m loving all of these beautiful and scenic shots of the sea and the sun! <3 🙂 Thank you so much for this super thorough post! Definitely going to bookmark this and all of the future ones coming one! I love this part of the world so so much! I went years ago but look forward to exploring again with my partner. It is just beautiful. Thank you for the tips. Book marking this post! In love with this place! We stayed in Positano, and fully intended to explore the different towns, but only made it over to Capri because we loved Positano THAT much! I definitely plan to return to the area to see more. We did a day’s boat trip to Capri (a small one, with only six people), and it was fantastic. Love your pictures!!! Hi Melissa, I always pick an aisle seat and get up every 30 minutes or so to walk up and down the aisles (in addition to drinking lots of water). I also have a packable wedge pillow (which I never ended up needing) just in case! Thank-you so much for sharing this Jean! I’ve saved this because I know I’ll definitely be coming back! The Amalfi Coast is so high up my bucket list! Beautiful!! Those views are breathtaking and so serene. It looked like so much fun. 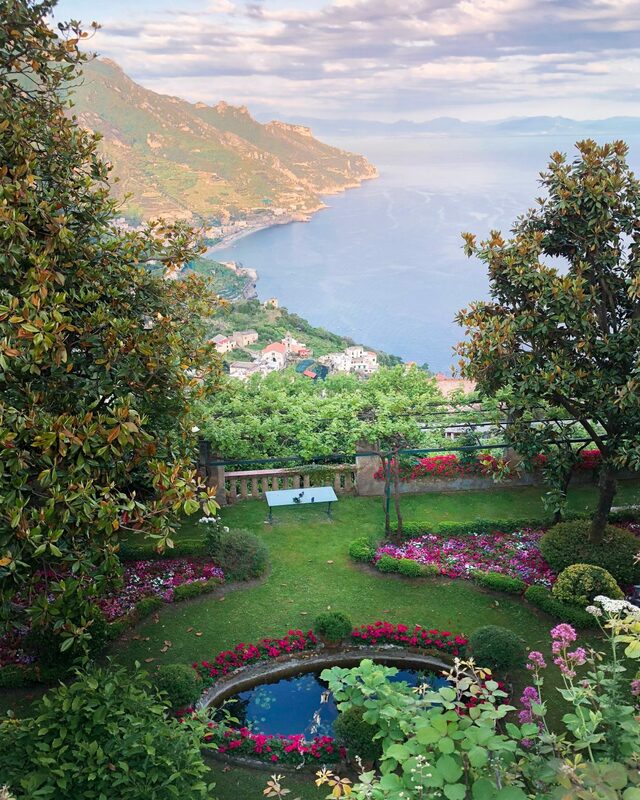 Im curious though, are those magnolia trees in the photo from Belvedere Principessa gardens?? My plant lady brain noticed that immediately haha..
I’m not quite as knowledgeable of a gardener haha so don’t know for sure! HI Jean! I loved your posts from Amalfi! I visited last May and we stayed in Amalfi the entire time – I actually did not experience crowds and thought it was more off the beaten path. The only day we experienced any crowds was when a cruise ship visited, so I would highly recommend staying in Amalfi. We also found the prices there much cheaper and the entire trip was not that pricey for us. Hi Jean! We just arrived back ourselves from an almost identical trip, except we stayed in Sorrento and used it as our base for exploring the coast. Sorrento was a great little town, very similar to Positano but possibly a little bigger. Looking back, I would probably also pick Positano to use as a central hub, but only because it was more centrally located. Our local driver recommended Bagni Delfino (at the Marina Grande) and L’Antica Trattoria in Sorrento for dinner. Both were absolutely the best food we had the entire trip! He also recommended Buca di Bacco in Positano for a fabulous view for drinks while escaping the crowds. It did not disappoint! Thanks for sharing the details of your trip, and I’m looking forward to your other posts! Jean thank you so much!!!! This is such a helpful post! Btw, what camera did you use to take your photos? All the photos in this post were taken on my iphone X, with the exception of pics #2 and the last one which were on my husband’s flying drone. For regular blog outfit photos (the ones with a blurry background) was use a Canon 6D. Keep the posts coming! I am leaving for Italy in less than a week and staying in Positano for a few days. I’m so glad I got to read about your trip! I plan to spend a day in Capri and will see how much I can cover on the coast. Wow how gorgeous! The scenery is crisp and wow how did you avoid all those tourists in your pics? How did you take your photos for this trip? I always have trouble taking vacations pics hahaha. Most of them come out rushed, off centered, or overcrowded with too many people. Can you make a post about how you take your vacation pictures? Thank you for the kind words, Teresa! That means a lot! We got married on the Amalfi Coast in Sorrento last year. It was beautiful. Sorrento is very busy but we married in a private court yard of a picturesque monastery. My favourite place was Ravello, stunning! Oh my goodness – what a dream!! Thank you so much for your informative post! I will be traveling to Positano and Amalfi in July and I can’t wait! I was thinking about renting a car to drive from Naples to Positano. Would this be possible? Hi Peggy – yes it’s definitely possible but parking in Positano is limited so it depends on what you want to do with the car afterwards (or if your hotel offers parking). As we approached Positano, we passed cars parked along the side of the road for over a mile outside of town – our driver told us that parking is so limited, everyone who comes into town for work from other areas have to park way out, then do the downhill climb on foot! Have been to the Amalfi Coast several times and I must say Capri is my favorite stop. There is more going on, more activities available and such spectacular scenery both in Capri and Anacapri. The island is big enough to allow you to get away from the touristy stuff. Especially enjoyed the walk/hike to the ruins of the Villa of the Emperor Tiberius. Also a must is a tour of the Villa San Michele in Anacapri. Loved the time we spent in Positano, especially cocktails at the Hotel Sireneuse in the evening. Ravello is also fabulous with many wonderful gardens to visit. My favorite stop for lunch is the Villa Maria where the views and the food are really wonderful! I plan to be on the coast again in September and cannot wait to return! Love your blog, Jean! You look absolutely beautiful pregnant. Your photos & post made me miss the amalfi coast so much. We went there for the first time when I was 7 months pregnant. We instantly fell in love with the beautiful villages & genuine people there and can’t wait to revisit one day. You should definitely visit Sorrento next time as well. Would love to go back someday and include Sorrento! Kudos to you for getting around there while 7 months pregnant! Lucky you! What a dreamy annual summer destination! Love your post. I’ve been and it’s gorgeous! Jean, first of all- you are always beautiful but look even more radiant with a little one on the way. Just wanted to say, this blog post may be my next itinerary! This is our next destination and came in so handy. You are so sweet, Jane – thank you! Oh you will just love it there! Hi Em – I travel heavier than the average person (at least I think so!) since I usually have a few blog projects to shoot when we travel. I brought 1 carry on and 1 checked luggage. Most of my clothes roll up tightly and don’t take up too much space, and I try to pack neutral bags, hats, and shoes that can be re-worn with multiple outfits! Wow the pictures are amazing ! Thank you for sharing your tips ! Will you be sharing any tips on traveling while pregnant? I am almost 5 months and just about to wrap up our first Europe trip. By week 2, I am exhausted! Hi Jean! What an amazing trip – my husband and I are looking to go at the end of August 🙂 I was wondering where did you fly into and how did you travel to Positano? Hi Tiffany! If you read the post (I know it’s lengthy so things can get lost), there’s a section titled “Flying there” and then the rest explains how we got to Positano and specifically downhill to our hotel (at the end). Hope that helps! I just want to reach into my computer screen and grab ahold of all the food!! they all look so amazing! Oh my goodness! What a DREAMY vacay! Would love to visit sometime – thanks for the roundup and review of places to go and how to save! Also, for your pictures, did you guys use a drone and what kind do you have? How far in advance did you book your flight and what website did you use? We are flying into Rome next year. Love this post!!! Love your blog!!! Love your carry on suitcase!! Is the bag expandable? Would you recommend the carry on and 27″ for a set? Who did you fly with for travel to Italy? (What airline/company) It looks so beautiful and my husband and I would love to go! Hi there do you know how long a ferry ride is from Positano to amalfi? If we do the lemon grove tour just wondering what time we would need to catch the ferry ! Thanks. I am traveling to Positano early October. You inspired me! Do you have a list of restaurants you recommend we eat at?